As you all probably already know, Rogue Spear is the sequel to Tom Clancy's Rainbow Six. 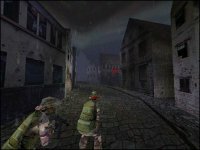 The attractiveness of Rogue Spear stems not just from it being the sequel to the original classic Rainbow Six, but also from the much-improved graphic effects and noticeably greater game depth. The military actions of the Rainbow team now reach greater realism with more character animations, new sounds and graphic effects, and more realistic real-world environments. The goal of our project here at Pipe Dream Interactive is to bring Rogue Spear to the Dreamcast with the same level of realism and dramatic gameplay exhibited in the stellar PC version -- no small task! Thankfully, Rogue Spear is proceeding much better than we had originally expected. 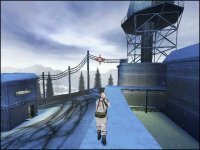 In fact, we've not yet hit any of the major issues in this project that we repeatedly ran into during the course of Rainbow Six. R6 gave us much insight and experience into the workings of the Dreamcast, and that is enabling us to ship Rogue Spear in a much shorter period of time, yet with more gameplay features. At the moment, we're working on controller configuration issues. Although the game will indeed support the Dreamcast keyboard, it's accepted that most players will still be using the standard Dreamcast controller. The original PC game utilized the entire keyboard for the various actions and game features, so compressing all of them into a single controller is an intricate task. As you might recall, for Rainbow Six we used combinations of buttons and directional pad presses to perform actions. Some players found that the many combinations were difficult to learn at first, and we've heard their complaints loud and clear. As a result, Rouge Spear will only use the directional pad for executing actions. We are also designing an extra feature for the HUD, which will list the actions that are available when the D-pad is pressed. If in doubt, the player will only need to look at the screen to know how to perform the desired action. At this point the engine has been up and running on the Dreamcast for a little over a week, and already we've almost completed the 3D graphics. We're also able to see some rudimentary multi-player support. Both two player splitscreen and four player deathmatch are working, albeit at very slow frame rates. However, because of the memory limitations of the Dreamcast, this is a big accomplishment for us -- especially so early in development. Memory savings and bug fixing will be our primary goals for the next couple of weeks. Keep your eyes on this spot for my next entry in a few weeks' time. Until then, enjoy these screenshots of the current version. See you in a few!